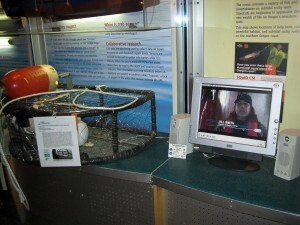 NEWPORT – A new exhibit at the HMSC Visitor Center showcases the success of a two-year federal/state/industry partnership that employed fishermen to retrieve thousands of lost or abandoned crab pots off the Oregon coast. Derelict Crab Gear Recovery: Oregon Fishing Industry Partnerships chronicles the outcomes of the partnership, which included a two-year, $690,000 grant from the National Oceanic and Atmospheric Administration, and involved commercial fishermen, the Oregon Department of Fish and Wildlife and Oregon Sea Grant, among others. Fishermen involved in the project hauled in more than 3,000 lost crab pots, nearly all of which were returned to their owners for repair and re-use. Lost fishing gear is an international problem; nets; lines, traps and other gear left in the ocean can foul ships, endanger wildlife and disrupt seafloor habitats. The Oregon effort grew out of a 2006 pilot conceived by the Oregon Fishermen’s Cable Committee. Sea Grant helped the group win a modest proof-of-concept grant from NOAA, and monitored initial retrieval cruises to determine their success and check the recovered gear for dead or trapped marine life. The broader project, launched in 2009, not only recovered tons of lost gear, but also advanced the understanding of the impact of derelict gear on marine resources. The new HMSC display includes a video documentary about the project intended to promote visitor awareness and stewardship of marine resources.